I have been seeing all kinds of gazpacho recipes made with almonds and white grapes in cookbooks, magazines, etc., so it has been on my "to make" list for some time. When I saw a very simple one on the (newish) show "5 Ingredient Fix" on the Food Network and also found some good grapes at Whole Foods, I decided to try it. What could be easier than five ingredients and a blender? The recipe for the gazpacho and the other no-cook recipes from the same episode can be found at the Food Network site here. Put the soy milk and almonds in the jar of a blender and puree until very smooth, about 2 to 3 minutes. With the motor running, slowly add the grapes, scallions and lime juice; season with salt and pepper and puree until well blended. To serve, pour into a small bowls and garnish with chopped or sliced grapes and sliced scallions. Note: Gazpacho can be served immediately but is even better if refrigerated until very cold. Stir well before serving. Notes/Results: Good, smooth and lightly fruity. Not my favorite gazpacho ever, I still prefer more savory, tomato based ones but it was nice for a change. I realized the only soy milk I had in the house was a vanilla one, so I substituted some plain almond milk, which works just as well. This soup goes together quickly and easily--just make sure to puree it until it is very smooth. It tastes good when first made but I agree with the recipe notes, it is much better when served very cold. I might make it again as a first course for a light summer lunch or dinner. It looks like we have a good-sized group in the Souper (Soup, Salad & Sammie) Sunday Kitchen today, including some new faces. Let's see what everyone made. Say hello to another Deb! Debs from Deb Cooks: "An English Girl, Living in Spain, Addicted to Cooking." Joining us for the first time, Debs brought a curry that eats more like a soup, her Jungle Curry of Guinea Fowl. She says, "A traditional wild food country curry from the north-central region of Thailand, this dish can be made using any game, fish or chicken. To be honest it was a very soup like consistency and therefore I question whether it is a curry or a soup. Nonetheless, it has a very good flavour and I would make it again, but I think it would be best served with noodles and eaten more like a soup." 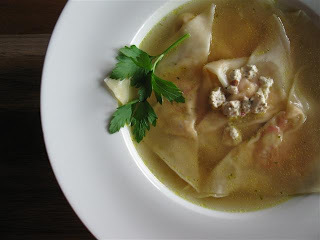 Natashya from Living in the Kitchen with Puppies made her own perfect little wontons to go into her Beijing Wonton Tang (or Beijing Wontons in Rich Broth). Being a multi-tasking kind of gal, this beautiful bowl of savory soup was also her entry for Cook the Books: "The Last Chinese Chef" (Catch the CTB round-up by yours truly here, but be ready to drool!). 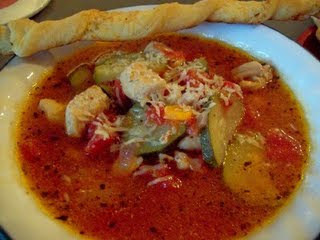 Natashya says the soup was, "A delicious meal that my family loved. Enjoy!" I say can you ship a bowl to Hawaii?! Pretty please! Welcome Faith from Thought 4 Food, joining us from Buffalo, NY and making her first visit to the Souper Sunday kitchen. Faith is transitioning into her favorite season, autumn, with this lovely Roasted Vegetable Ravioli in Vegetable Broth. Faith says, "With its roasted vegetables and warm broth, this soup is the perfect introduction to fall. The roasted vegetable and Neufchatel filling for this ravioli would also be delicious tossed with some pasta or spread on crostini…that way you would get to see its pretty rosy color!" I'm pretty sure it is also the first time participating in Souper Sundays for Natasha from 5 Star Foodie Culinary Adventures, hailing from Northern Virginia, (although since she pops by often with comments I feel like she is an old friend!). Natasha stumbled upon a stand of hatch chilies in front of her local Wegman's and grabbed up a bunch. She says, "The green Hatch chiles were sweet and juicy with just a little bit of a spicy kick, and perfect as a featured ingredient for a refreshing gazpacho. 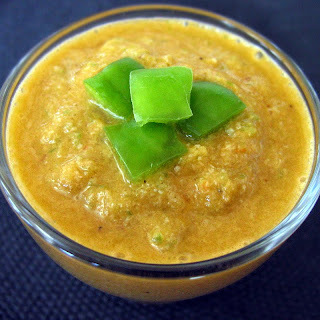 This Hatch Chile Gazpacho is delightful for these hot August days." Also highlighting chilies this week, in this case chipotle peppers in adobo sauce, is Kait from Pots and Plots, who made this spicy, filling Chipotle Chicken Soup, inspired by a dish she ate at a restaurant. 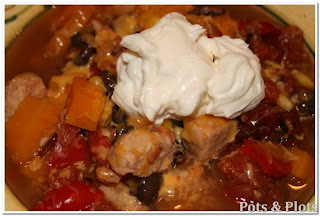 Kait says, "I started with the vegetables I use as a base for both taco and tortilla soup, then started adding things. Since I love sweet potatoes so much with chili powder, I thought they might be a good addition to this–some sweet to help balance out the spicy." Lissaloo from One Step at a Time is back and says that she wanted to try another fruit soup so she tried this Pretty Peach Soup. Made with peaches, raspberries and yogurt, Lissaloo says, "Now I have decided that fruit soups are a lot like fruit smoothies, and I think I am over my fruit soup phase for now :) This was really yummy, I tested it out on my guinea pig first, um I mean daughter." Did she like it? Lissaloo says that she drained the goblet of soup and "then she asked "Can I have some more?" Ahhhh the music to every Mom's ears." Suzie from Munch & Nibble was so enamoured of a bowl of beef borscht she tasted while on a trip to the Australian Alps and asked for the recipe. Finding out it was from a cookbook she was lucky enough to receive as a gift, she was able to make this Borscht with Horseradish Cream. 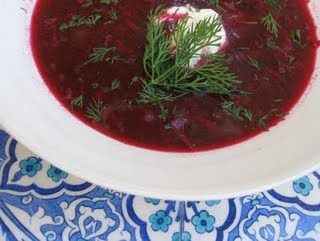 Suzie says, "The borscht is one of those slow cooked meals that brings to mind the maxim that "all good things take time." The end result is delicious, and I still have two or three tupperwares of the soup in my freezer. Perfect winter sustenance!" 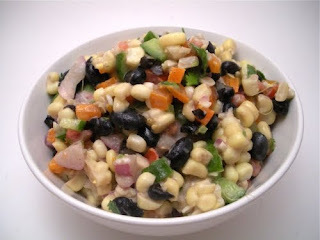 Corn is a favorite summer staple for Chrystal & Amir from The Duo Dishes and they made this fresh and crisp Honey Roasted Corn and Black Bean Salad out of summer's bounty. They say, "We made this salad a few weeks ago for a friend’s housewarming party. It definitely has great ‘make ahead’ potential. Roast the corn early or the night before, so it has time to cool completely. But, if you’re in a pinch for time, there’s no reason why you can’t toss the warm kernels in with everything else." Chaya from Sweet and Savory Says it All (and also Chaya's Comfy Cook Blog), is here with a hearty, crunchy Cauliflower Salad. Made with a combo of cauliflower, broccoli, peas, celery cashews and water chestnuts and dressed in a sweet and tangy mayonnaise dressing, this salad is one good way to get your daily intake of veggies in. With her busy schedule of orientation for medical school, bonding with her class and training for a marathon, I am surprised that Joanne from Eats Well With Others has time to breathe, let alone cook. Joanne says, "At this point in the summer, when eggplants and tomatoes abound, what makes more sense than an Eggplant Parmesan Sandwich? Especially when the eggplant is grilled (or broiled in my case), layered onto some good rosemary focaccia or ciabatta with slices of tomato, sprinkled with a dusting of parmesan cheese, and then popped under the broiler again so that the cheese gets melty and the bread gets crispy? There is very little that could have satisfied me more." Wow! Lots of great soups--both hot and cold, a couple of delicious salads and even a yummy sandwich. Thanks to everyone who joined us this week and welcome to all of our new faces. If you have a soup, salad, sandwich or combo of any of the three that you want to share at Souper (Soup, Salad & Sammie) Sundays, click on the logo on the sidebar for all the details. Papaya Frappe--A Frothy and Fruity "Simple Saturday Sipper"
I recently added a bargain copy of the Moosewood Restaurant Book of Desserts to my cookbook collection. I was flipping through it today and found a recipe for a "Manhattan Papaya Frappe", their healthy take on the frothy fruit drink served at the Papaya King hot dog stands in New York. Excellent timing because I didn't have a "Simple Saturday Sipper" decided on for today, and in yesterday's CSA box I had a very ripe papaya that needed to be used. The Moosewood Collective adds a cup of fresh or frozen strawberries to their drink but I left mine with just the papaya. apple banana and limes, all from my CSA box along with some pineapple juice. In a blender , puree the papaya, banana, lime juice and pineapple juice until smooth. Add the ice cubes and whirl until the ice is completely broken up. Taste and add sweetener if desired. Notes/Results: Yum! I think I found a new use for any extra-ripe papayas that I receive. This is thick, fruity, and refreshing, very drinkable. Moosewood suggests adding "a little rum or campari if the spirit moves you," and I was moved to add some to my second drink, after dinner. A little pineapple rum and it was excellent. The book also says you can add yogurt for a heartier breakfast smoothie and if you can't find papayas, an equal amount of cantaloupe will do--although the drink will be slightly thinner and sweeter. I will make this one again. In my BMB (Before My Blog) days I went through a long phase of cooking Indian food once or twice a week. I think it was a combination of not being able to find really good Indian food here and the fact that a great little Indian market opened up nearby, giving me access to good ingredients. I love all the different flavors in this cuisine and although some better Indian restaurants have opened up and I get busy making other things and don't cook it as often as I used too, I still enjoy it. Surfing Tyler's recipes on Food Network for something new to make for TFF, I found his recipe for Saag Paneer and decided to give it a try. if you are not familiar, saag paneer is basically greens--usually a mix of spinach and mustard leaves, cooked with paneer, a type of cheese. (As Tyler's recipe is just spinach leaves, it could also be called "palak paneer"). Paneer is a white, farmer's style cheese that is firm and doesn't melt. (A very firm tofu makes a good vegan substitute). You can find Tyler's Saag Paneer recipe as well as his recipes for curry powder and ghee at the Food Network site here. Bring a large pot of water to a boil, toss in the spinach and blanch for 1 minute until very tender. Dump the spinach into a colander and press firmly with the back of a spoon to extract as much water as possible, set aside. Heat the ghee in a deep skillet over medium-high flame. Add the cubed paneer and fry for a couple of minutes until light brown on all sides, gently turning to avoid breaking up the cubes. Remove the cheese from the skillet and set aside. Return the skillet to the heat and sauté the onions, garlic, and ginger; cook and stir for about 5 minutes until soft. Sprinkle the mixture with the curry powder; continue to stir to marry the flavors, about 1 minute. Fold in the chopped spinach and give everything a good toss. Shut off the heat and stir the buttermilk and yogurt into the spinach to incorporate. The mixture should be creamy and somewhat thick. Gently fold in the fried paneer cubes, season with salt, to taste, and serve with steamed basmati rice and/or flat bread. Notes/Results: Really good, flavorful and not too heavy, especially using the low-fat buttermilk and non-fat Greek yogurt. Although I have some ghee in my pantry, I just used a bit of olive oil to saute my paneer and onions. I also used my favorite brand of curry rather than Tyler's mixture, (which is good--just not my favorite). Both the curry and ghee recipes are on the Food Network site if you want to make your own. I did double the amount of curry in the recipe--I like as much curry flavor as I can get. Without making the ghee and curry powder, the recipe goes together very quickly and easily and I had dinner on the table in a little over 20 minutes. I served mine with a jeera (cumin) rice mix and some paratha, an Indian flatbread, from the Indian market. 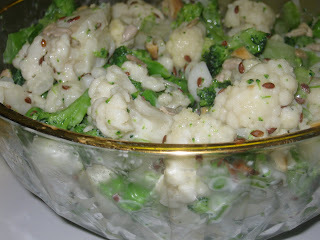 A perfect vegetarian meal, creamy and satisfying and a great way to work those greens into your diet in a tasty way. I would make this again. You can see what the rest of our Tyler Florence Fridays participants made this week and find out what they thought about their choices by going to the TFF site here. Our second Barefoot Bloggers recipe for August; Ina's White Pizza with Arugula was selected by the wonderful Andrea of Nummy Kitchen. I happen to love pizza bianca or white pizza, because I think not having tomato sauce really allows the flavors of the toppings to come out. Ina's pizza is covered in three kinds of cheese--fontina, mozzarella and goat cheese and then is topped with some lightly-dressed arugula salad. It sounded delicious but I wanted to cut down a bit on the amount of cheese (love it but don't need so much of the extra fat and calories), but substitute it with some veggie toppings to keep it satisfying. I had decided to add some oyster mushrooms from my CSA box and was trying to think of another veggie when I saw a comment on the BB page from Kate at Warm Olives and Cool Cocktails that said she put potato on her pizza. Bingo! I love thinly sliced potato on pizza. Thanks Kate! ;-) My other confession...I didn't make the pizza dough! (cue gasp of horror!). It's like this, I made the dough when we did grilled pizza last year so I know I can do it but I am having "a week", it was hot today and frankly I just didn't feel like messing with the extra steps. Solution? Whole Foods in their deli section has baggies of freshly-made whole wheat pizza dough that is really good, so I grabbed a bag and saved myself some time, effort and a couple of kernels of sanity. It's cheaper and better than most pre-made crusts and I like the fact I can work the whole wheat in there too. You can find the recipe for Ina's pizza in "The Barefoot Contessa Back to Basics" (pages 197-198) or on the Food Network site here. Combine the water, yeast, honey and 3 tablespoons of olive oil in the bowl of an electric mixer fitted with a dough hook. When the yeast is dissolved, add 3 cups of flour, then 2 teaspoons salt, and mix on medium-low speed. While mixing, add up to 1 more cup of flour, or just enough to make a soft dough. Knead the dough for about 10 minutes until smooth, sprinkling it with the flour as necessary to keep it from sticking to the bowl. When the dough is ready, turn it out onto a floured board and knead it by hand a dozen times. It should be smooth and elastic. Place the dough in a well-oiled bowl and turn it to cover it lightly with oil. Cover the bowl with a kitchen towel and allow the dough to rise at room temperature for 30 minutes. Tips: Make sure the bowl is warm before you put the water and yeast in; the water must be warm for the yeast to develop. Salt inhibits the growth of yeast; add half the flour, then the salt, and then the rest of the flour. To make sure yeast is still "alive," or active, put it in water and allow it to sit for a few minutes. If it becomes creamy or foamy, it's active. Thanks to Andrea for a great and delicious choice! You can see who the other Barefoot Bloggers are and see what they thought of their pizzas by going to the BB site here. 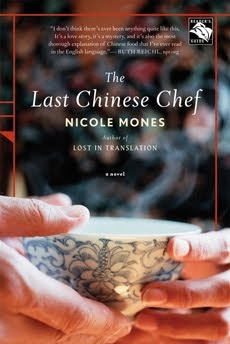 Our current selection for Cook The Books, (the bi-monthly foodie book club founded and hosted by Rachel of The Crispy Cook, Johanna of Food Junkie Not Junk Food and me), is "The Last Chinese Chef" by Nicole Mones. As the host for this round, I selected this novel for a couple of reasons, the first being the wonderful writing of Nicole Mones, who writes about China in such a descriptive way that it makes you feel as though you are there with her. Secondly, I wanted the opportunity to have CTB "journey" to China and delve into the realm of Chinese cooking, which although I love, I have limited experience in cooking. "The Last Chinese Chef" is the story of Maggie, a journalist and food writer still trying to heal her heart from the sudden death of her husband the previous year. Maggie must make a personal trip to Beijing to settle a claim on her husband's estate and rather than giving her time off, her editor gives her an assignment to interview Sam Liang an up and coming Chinese chef. I won't go very far into the details so as not to spoil it for you if you haven't read it yet, but the story is about Maggie finding herself while being drawn into Sam's world and the incredible food and culture of China. Interwoven in the story, at the start of each chapter are excerpts taken from a book written by Sam's grandfather, entitled "The Last Chinese Chef" which serves to explain the history and traditions of food in China and draw the reader into this fascinating culinary world. With themes of food of course, plus love, family, growth and discovery, this is a wonderful, sumptuous book that will tantalize any foodie with the descriptions of the amazing array of food Sam cooks and Maggie tries. 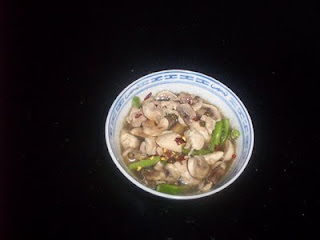 Although there were many exotic dishes in the book, or dishes that one could relate to the book, from the start I knew what I wanted to make, Congee. Simple and basic, congee is a sort of rice gruel or porridge that is eaten in China as well as with some cultural variations, in many other Asian countries. 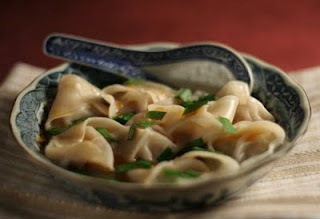 In China it is considered as breakfast food, comfort food and often a cure for those feeling unwell. It can be served very soupy, or drained and is accompanied by different salty, sour, or bitter toppings. You see it a lot on menus here in Hawaii either as congee or also "jook" and to be frank, I have never been a big fan. Probably my lack of enthusiasm stemmed from my "texture issues" as things like grits and cream of wheat hold little appeal for me. Also, the few times I did try it, I thought it lacked flavor. Still after reading the description from the book, I thought it was time to give congee another try, making it fresh as Sam does with lots of little toppings. Congee also seemed to really illustrate many of the themes of the book in one simple dish which I liked. From the book: "Congee. It's the simplest food, the most basic. But it takes care. It's like love". He looked straight at her; she could feel him looking right through her clothes to her body, to her heart, He gave the pot a stir. "First it must have that fragrance of fresh-steamed rice. Then the toppings." He gestured to at the side counter, which was crowded with little bowls he had been preparing while the aromatic rice was cooking. There were tiny squares of crunchy pickle, slivers of greens, velvety cubes of tofu, tiny smoked-dried Hunan fish mounded up in a crispy, silvery tangle. There were peanuts, shreds of river moss, crunchy soaked fungus, and matchsticks of salty Yunnan ham. He brought the tureen in. All the dishes around it made a pleasing circle. She surveyed the condiments. She selected greens, pickle pieces, and the tiny fish. Following one more suggestion from Sam's eyes, she took slippery cubes of fresh tofu too. She mixed her congee with her spoon and tasted it. Oh, so good. She shivered. The salty and piquant flavors against the delicate fragrance of the rice, the crispy fish against the tofu and the soft gruel. Sheer goodness. There are countless recipes for congee on the Internet and in most of my Chinese cookbooks. I took a few things from many recipes and came up with what felt right to me, adding a piece of peeled ginger to the rice while it cooked to impart some more flavor. In a large pot, bring the water, rice, salt and ginger to a boil. When the rice is boiling, turn the heat down to low. Place the lid on the pot, tilting it slightly to allow steam to escape. Cook on low heat, simmering gently while stirring occasionally, so the rice does not stick to the bottom. Cook about 1 1/4 - 1 1/2 hours or until the rice has the thick, creamy texture of porridge. Remove ginger and serve with the toppings of your choice. Notes/Results: A thick, creamy bowl of soft soupy rice, lightly scented with ginger, it made the perfect foil for all the little toppings. Even having a Chinatown in Honolulu, I was not able to locate all of the toppings mentioned in the book but I did my best ending up with many of them. I had the roasted peanuts, the black fungus (thinly sliced wood ear mushroom, rehydrated), cubes of Asian pickles (I can't swear they were Chinese! ), thin slivers of greens (a mix of mint, cilantro and watercress), little cubes of firm tofu, strips of salty, dry smoked ham (hopefully somewhat similar in flavor to Yunnan ham). I was unable to find river moss and when I tried to figure out which little dried fish to buy when faced with many choices, three groups of Hawaiian-Chinese store workers told me that I shouldn't put them in the congee/jook, saying I would ruin it so I gave up, not sure I was "feeling" the fish as a topping for me anyway. I also prepared a small bowl of green onions, because I thought the flavor and texture would work well. With my toppings and congee ready to go, I prepared my bowl with a little of everything and tried it. Surprise! I loved it, the rice was tender and the different tastes and textures of the toppings were delicious. I had my first bowl for dinner, then reheated a bowl for breakfast the next day. I think I might be a "congee convert", although not something I would eat all the time, it was really good and a nice comfort-food meal. A terrific book and a great meal, which is what Cook The Books is all about! The deadline for "The Last Chinese Chef" is this Friday, August 28th and I'll be doing the round-up of all of the dishes inspired by the book at the CTB site right after that. Then our author Nicole Mones, who is as kind and generous as she is talented will be selecting her favorite entry and the winner will receive the Cook The Books Winners Badge to display on their blog. Didn't have time to read this selection and cook a dish? Read the book anyway--it's that good, and join us for our next selection, Peter Mayle's French Lessons, hosted by Johanna. In other book news, I am happy to announce the winner of my recent giveaway who will recieve their own copy of The Frugal Foodie Cookbook by Lynette Rohrer Shirk and Lara Starr. I wrote down the names of everyone who left a comment with their own favorite frugal foodie-style tip, (BTW--Some great frugal tips everyone! ), and then randomly drew out one name. "We've recently been restricted to a new budget and I'm having a hard time with it. I've always been frugal with everything...except food! I actually recently wrote about how I buy the market roast chickens and use the dark meat for one meal, and then the breast meat for two others. I've been able to stretch that roast chicken over three nights!" Please email me with your mailing address so the publisher can send out your book. I just noticed that today marks my 400th post! I am amazed that it came so fast and that I have had that much to say. ;-) I am still having fun and I am enjoying all that I have learned and everyone I have gotten to know through doing this. Mahalo (thank you) to all of you who read my blog and take the time to leave such positive comments--it really means a lot to me. Of course there is still no shortage of the (mostly) food related "Things I Am Loving This Week." For example I am so loving mangoes right now. Actually I love mangoes any old time but at the height of mango season they are just so perfectly firm, sweet and good. Local mangoes abound at the farmer's markets, the stores and even my CSA box (that big gorgeous beauty in the back was in my box last week). My favorite way to eat them is right over the sink with the juices running everywhere but I also love them in smoothies, drinks, last weeks crab parfait, and with some homemade vanilla ice cream. Mango ice cream and sorbet are good, but for me cut up juicy mangoes with a scoop of homemade vanilla ice cream (or vanilla frozen yogurt if I am being healthy), on top is that perfect creamy combination. Yum! 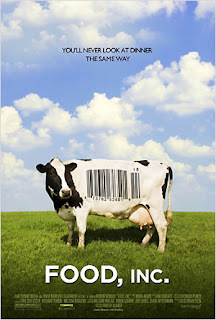 OK, it is hard to really "love" Food Inc. which pushes any action and horror movies aside as the scariest, most disturbing movie of the year, but it is so well done and it is a movie everyone should see. Food Inc. is an exposé on the food industry that looks at how large corporations run our food system, putting profit ahead of our health and safety with no policing from the very agencies set up to do so, the FDA and USDA. If you are at all into healthy eating, sustainability, organics, etc, it won't be completely new information for you, but it is presented in such a clear and very chilling way that you'll still walk away feeling shell-shocked. It is directed and produced by Robert Kenner and co-produced by Eric Schlosser, (Fast Food Nation), and it features my hero Michael Pollan among others. The ultimate message of the film is that we as consumers need to be aware of what is really going on in the food industry and do our part by "voting with our dollars" to make a change. No message is more important right now! I do recommend you eat a healthy, local, preferably vegetarian meal before you go see it--you ain't gonna be hungry afterward! I was lucky enough to see it with my foodie friend and fellow food blogger Michelle at The Accidental Scientist and we ate a very pure, healthy meal at a macrobiotic community dinner before the film. The meal featured local style food (tofu poke, seitan musubi, potato/mac salad and haupia for dessert), made vegan and was delicious and the perfect thing to eat before the movie. (I was so caught up in catching up with Michelle, I forgot to take pictures but trust me it was amazing food!) Anyway go see this movie if you can or at least rent it when it comes out--it will make you think. Finally, I really love Ina Garten's Panzanella Salad. We made it last year for Barefoot Bloggers, (you can see that post with the recipe here), and I have made it a few times since then, including Saturday for a wonderful Italian-themed dinner party I went to. Nothing is more perfect for using the bounty of the season (like local tomatoes, cucumber, peppers, red onion and basil), than this hearty and delicious salad. My only "issue"? I have to make extra croutons because I have a tendency to eat all the bread chunks as they are toasting in the olive oil. It is quick and easy, tastes so good and is always a hit with anyone who tries it. The perfect "go-to" recipe for late summer. That's what I am loving this week! How about you? BTW--You have until 6:00 PM (HST) today, Tuesday, August 25th to enter my giveaway for a copy of the newly published "The Frugal Foodie Cookbook". I'll be doing the random drawing and announcing the winner tomorrow. You can read my review of the book and get the details on how to enter here. For some reason the week really got away from me and the weekend has been a bit crazy so I didn't have time to make the cold soup I had tabbed for this week. Instead, I have a quick and easy soup I threw together last week when I was craving something a little spicy and different. This recipe for Curried Fish and Herb Soup comes from "Souper Duper Soups: Healing Soups for the Mind and Body" by Michael Van Straten. I like this book because it has quick and easy soups with various health benefits like "immunity-boosting soups", "restorative soups", "good mood soups", "warming soups", etc. This soup is listed under "slimming soups", which are lower fat, yet still filling. I thought the combination and simplicity sounded good and I had some local Kajiki (Pacific Blue Marlin) that I thought would work well in it. Van Straten says: "Here's a very low-fat, spicy soup that makes a great one-pot meal for slimmers. Low in calories, rich in nutrients, substantial and filling, this would make a perfect evening meal followed by a salad, some fresh fruit and about 2 oz of low-fat cheese. Dieting can be stressful, and this combination of nutrients helps fight the stress as well as the flab." Melt the butter in a large saucepan. Add the onion and saute gently until soft and golden. Sprinkle with the curry powder and continue cooking for 2 minutes, stirring thoroughly so that the curry powder is well combined. Add the fish, herbs and spices and the fish stock. Bring to a boil and simmer for 10 minutes, or until the fish is cooked. Remove the bay leaf and woody herbs. Add the yogurt and stiff carefully without breaking up the fish. "Vital Statistics: Iodine in the fish stimulates the thyroid. Traditional curry spices help boost the circulation and metabolism. You get extra calcium and B vitamins from the yogurt." Notes/Results: Savory, lightly spicy and very good, this made the perfect simple dinner. Filling but not heavy, it is a very satisfying soup that really hit the spot and it is a gorgeous color from the curry and saffron. It is easy enough to make and light enough that it works even in warm weather. The only changes I made were using olive oil to cook the onions and using a local fish. A keeper recipe--I think I might throw in some fresh corn the next time I make it to change up the texture a bit and add some sweetness. L.K. from Healthy. Delicious. 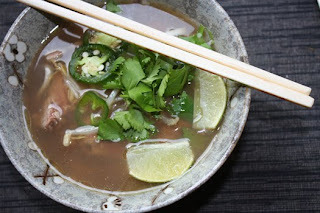 tried her hand at Beef Pho (Pho Bo) this week and says, "It might seem silly to made soup in the summer, but then again it might seem silly to make souffle in 90-degree heat, so chalk thus one up to me “doing something crazy” theme this week if you want. Anyway, I’ve heard that eating hot foods when its hot out actually cools you off. I don’t know how much I believe that, but it did make a good summer meal and it was light enough that it didn’t make me really full. I hate feeling full when its hot out, so that was good." Also rethinking her position on soup during the summertime is HeatherFeather from Lavender Blue, here with an Italian Style Chicken & Vegetable Soup. Hailing from the temperate climate of Florida means there are fewer cold days to enjoy a bowl of warm soup so she decided not to wait for a rainy day. She says, "The soup was really easy to make and was rather tasty. I made only a few minor changes to the recipe, although I think next time I might trying using some leftover roasted, shredded chicken instead of bothering with the diced chicken, and I might also add some tiny cooked pasta shapes. Oh.. and guess what... it even rained for the occasion." 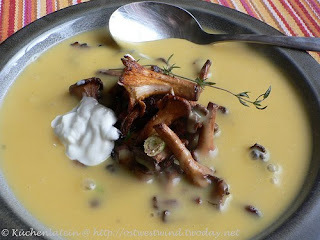 Ulrike from Küchenlatein says, "This week I made a Potato-Cream Soup with Chanterelles for a German event called "Fremdkochen", cooking from other blogs. Chanterelles are in season now, they are fried with bacon and added to the soup just before serving with a dollop of sour cream. The soup is simple, just a potato soup seasoned with fresh thyme and enriched with sour cream." Looks like a creamy and delicious dish that makes the most of her seasonal produce. 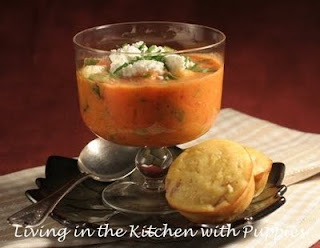 Natashya from Living in the Kitchen with Puppies says, "I am on a cold soup kick this summer. I don't even know if I had ever had one before this year but I seem to be making them regularly lately." This week she tried Tyler Florence's Watermelon Gazpacho. Natashya says, "A soup you can make in a blender, what can be better than that? This gazpacho is lighter and a little sweeter with the addition of watermelon. I found it very refreshing. Perfect for a hot summer day." 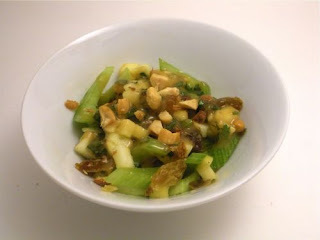 Inspired by a childhood favorite, "Ants on a Log", Chrystal and Amir from The Duo Dishes, created this sweet and savory Celery, Apple and Raisin Salad with Peanut Dressing. The Duo says, "A crunchy, sweet salad with spicy peanut butter dressing. For some folks, it may sound…well…gross. Honestly, it was off the chains! It’s great as a side salad, but if you decided to toss it with grilled chicken, shrimp, tofu or noodles we wouldn’t be mad. There are a lot of really distinct flavors that harken back to Thai food, so if you’re a fan of Thai, you’ll probably love it as much as we did". 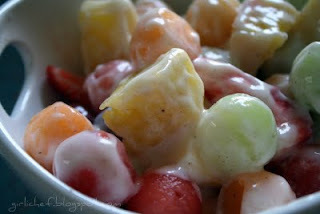 Deciding to "go a little bit crazy with the fruit" this week, Heather from girlichef put together a gorgeous Fruit & Yogurt Salad with Honey & Cinnamon, that she calls "a big bowl of summertime satisfaction." Heather says, "Choose your favorite fruits...or some new fruits you haven't tried...or just use the same ones I picked (it was a good combo)...go fruit wild! I went with 6 fruits all in various colors-because it's all about eating with eyes! Now...make yourself a little yogurt dressing for tossing it all up and bringing it together well." Joanne from Eats Well with Others loves her pasta and made the most of it with a Greek "Caprese" Pasta Salad. Joanne says, "Since I really loved the fresh tomato sauce from last week's caprese salad, I decided to remake it but with a twist. I Greek-ified it. You see, I had feta cheese on a salad the other day and set myself off on another craving spree. I think everyone felt the same way because I left with two pounds worth of pasta salad and came home with an empty bowl." Joining us this week is Kim from Stirring the Pot, from Georgetown, Kentucky. Busy cooking from a new cookbook, she made some Apple-Walnut Turkey Sandwiches. Kim says, "This is a perfect no-cook lunch or dinner that is quick to throw together. For this recipe, I replaced the mayo with my Oikos Greek Yogurt. I love the idea of using the Greek yogurt to replace the mayo because the yogurt has zero fat, is lower in calories, and is much creamier than mayo! his was sandwich was delicious, filling and just plain lovely. I really enjoyed the crunch of the celery, apples, and walnuts." Have a great week and don't forget to enter my giveaway for a copy of the new "The Frugal Foodie Cookbook". Get the details and read my review of the book, here.